Oily skin is more prone to breakouts than dry or normal skin. Excess oil or sebum production tend to attract dust and pollutants easily resulting in multiple skin problems. While having a pimple or two is normal, excess acne is obviously undesirable and should be controlled. 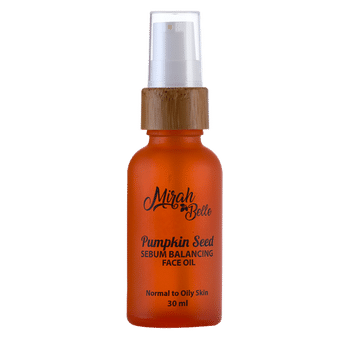 Mirah Belle Pumpkin Seed Sebum Balancing Face Oil controls the level of sebum production in your skin and protects your skin from unexpected breakouts. Pumpkin seed oil in it is suitable for both oily/acne-prone skin and dry/damaged skin. It not only balances the sebum production in oily skin, but also repairs dry and flaky skin and prevents skin problems such as eczema and psoriasis. Rich in healthy fats and antioxidants, this oil aids in keeping your skin healthy and smooth, owing to its deep moisturising ability. It reduces the signs of ageing such as wrinkles and fine lines, by boosting skin elasticity, thanks to its rich vitamin A and E content. Loaded with zinc, this oil is anti-inflammatory in nature and helps to protects the skin from acne and scars.